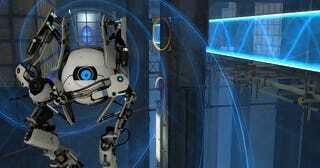 Valve’s been showing a demo of a virtual reality Portal game behind closed doors for a few months. Now, finally, you can see the whole thing. Basically, you mess around with some drawers—one of which contains a tiny civilization that recoils in terror upon seeing you, the Science Giant—and struggle to repair a robot more multifaceted than one of those sandwiches from the old Scooby Doo cartoons. After that, an old friend crashes the party. You are, of course, quite glad to see her. Well, glad-ish. So here’s the thing: walking around with my own two feet and spinning the demo’s mechanical cogs with my hands? It was super cool, verging on mind-blowing, when I got to do it a few months ago. Watching a shriveled up video of that—at the time—enormous experience? Decidedly less impressive. Once again, we confront VR’s big sticking point: you’ve got to try it for yourself to get anything even resembling the full impact. For everyone else, it’s hard to see what all the fuss is about. This goes double for Valve VR, where the main appeals include walking and touching—things you have to feel, in other words. This stuff is gonna live and die based on people getting to try before they buy, whether through friends, stores, events, or something else.